The gi Mike Fowler designed specifically for his match against turtle guard legend Eduardo Telles. This is perhaps the most beautiful garment I’ve ever seen, forget jiu jitsu related. 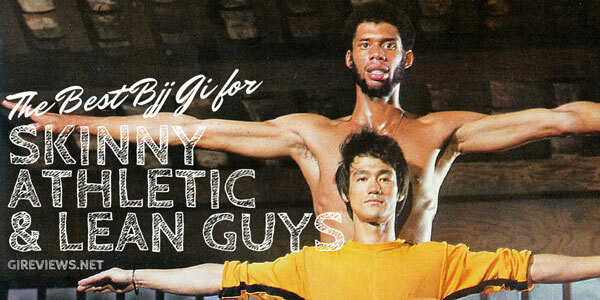 As a gi it is a tough, functional product. 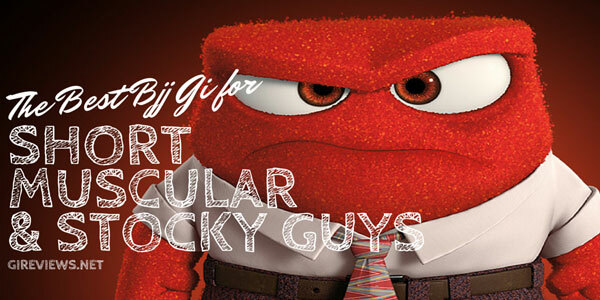 Do you have this gi yet? No? 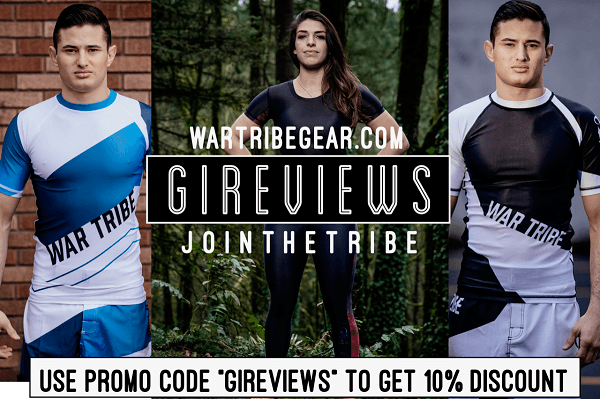 Stop reading this review, purchase the gi here BEFORE THEY SELL OUT. Seriously. This gi is gorgeous and amazing and might give you superpowers. If you’ve read my reviews you know that I don’t generally gush about gis. I say it like it is. And this gi just happens to be incredible. This gi is an A3. As I always mention the very best size for my build is A2L (6’1 195) but I can wear A3. This specific gi has a top that fits me perfectly and, but the trousers are just a tad bit short. Not really too big of a deal given that the gi will never be comp legal, but just something I noticed. If you like your pants a touch short, or are a bit stocky this gi will fit great. Also they offer some L sizes as well. This gi is GORGEOUS. The top is made of a lightweight gold weave with sublimated lycra covered lapel and outer cuffs. The trousers are made of twill also with sublimated lycra covered cuffs. The yoke panel has a different print of the same material as the lapel and cuffs. The lapel has a light green piping running alongside it. The gi has embroidered details throughout, mostly flowers. Flowers around the sleeves as well as on the hips. A single modified Fokai logo hit is on the center of the back of the top and on the right pant leg. Tatami has their name written in script on the front and back of the gi top. The Gi’s color scheme is white, navy, red and a greenish rope. This gi is even prettier in person than in pictures. Seriously. 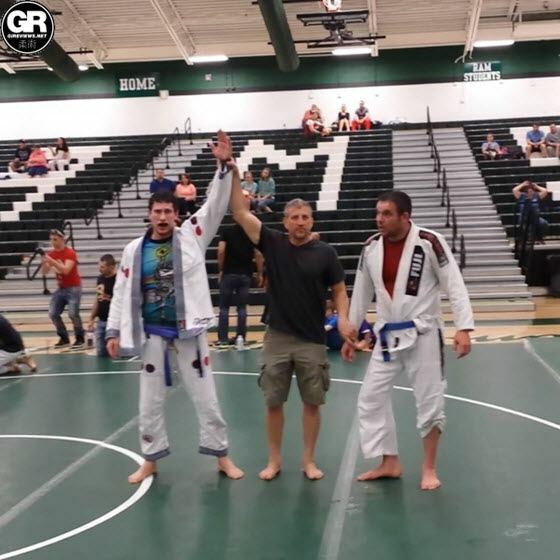 I liked this gi so much that while reviewing it I wore it to a seminar as well as a tournament just to see the reactions I’d get. They were good. The jacket fits perfectly. I love the sensations of the different materials that its made of. The soft gold weave and the lycra collar are a great combination. The yoke panel on the inside is also made of lycra with a floral print. The lycra on the cuffs and the bottom of the skirt are entirely external while the Lycra covering the collar wraps all the way around. to the inside. I found it interesting that there was no seamtape at all throughout the gi, there is however twill piping on the side vent. I was a bit concerned about the potential difference in durability of the lycra. However while the collar did eventually start to wear a bit, it retained its shape and never wore out. 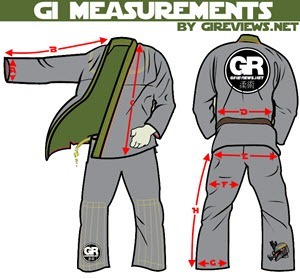 Given the lyrca on the collar and on the cuffs, the gi is NOT IBJJF legal, but I’ll say this: I would advise anyone who owns the gi to wear it to tournaments as it makes collar and sleeve grips far more difficult than any other innovation that I’ve seen on a gi. The jacket also has flowers embroidered around the arms, the Tatami name embroidered in cursive on the bottom of the back of the skirt as well as the front and the front embroidery also has the Fokai logo next to it. That same logo is featured below the neck in the back. The cotton twill pants follow the pattern of the top with lycra on the cuffs, flowers around the hips and a single Fokai logo on the bottom of the pant leg. While the pants don’t have my favorite feature that pants can have (gi material sewn into the gusset) they do have a feature I really like: full length double fabric knee padding. The loop system is interesting with three normal loops and a loose patch that serves as a loop (the patch has some artwork, Mike Fowler’s signature and the Tatami logo on it). The Loops are navy red and navy and the stretchy rope that Tatami went for is the same green color that the lapel piping is. The pants fit okay, but they’re a bit short for my liking. Also there was a pervasive chemical/mothball odor to the pants that still hasn’t entirely gone away. Both of these issues don’t affect the gi very much and it’s still one of my favorite gis ever. The lycra is slippery and makes obtaining grips on the lapel and the cuffs very difficult. I like that. Also the gi itself is super comfortable with the plush gold weave, twill pants and lycra being perfect complements for each other. I believe that Tatami made an A2L model of this gi, I may have enjoyed that just a bit more, but again I’m not complaining at all, this gi is as functional as it is GORGEOUS. If you haven’t seriously considered purchasing this gi yet, shame on you. 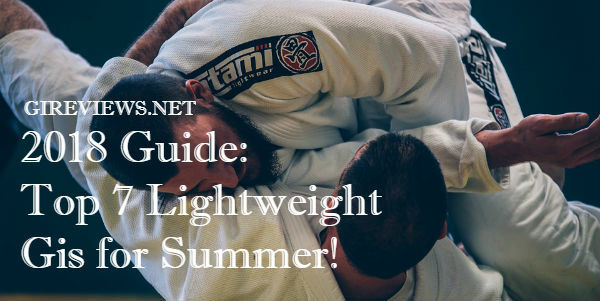 Buy this gi (Click here to purchase Tatami Mike Fowler gi from Amazon). You will be really happy with it and everyone you meet will be really jealous of you for having it. Unless they have it too in which case you can nod to each other knowingly. 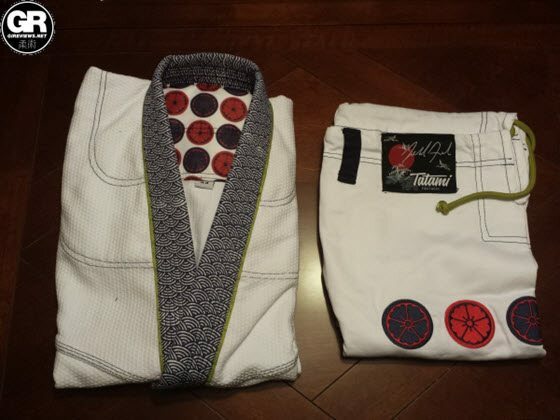 Get your very own Tatami Mike Fowler Signature Gi on Amazon NOW! Disclosure: This Gi was submitted to me free of charge (by way of gireviews.net) for review. I have never done any work with or for Tatami Fightwear.